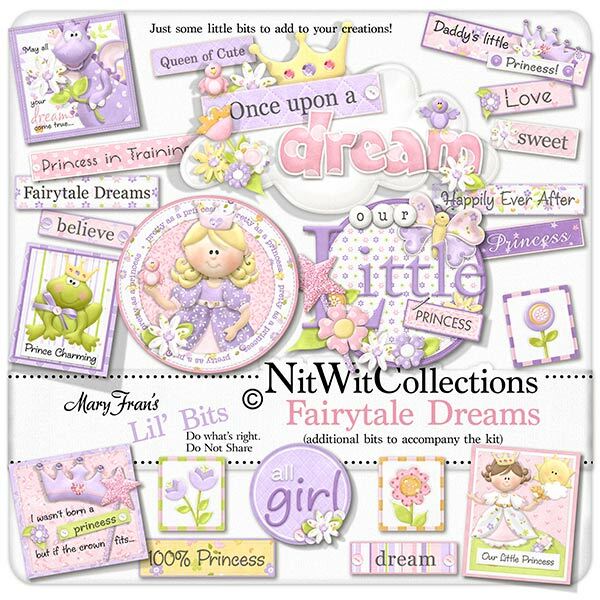 Lil' Bits "Fairytale Dreams" contains plenty of extra elements to co-ordinate with my "Fairytale Dreams" Fat Quarter Bundle Collection. You know you're going to need a few extra extra elements for this special Collection. Elements in the Lil' Bits are not included in the "Fairytale Dreams" FQB..
1 Square - "May all your Dreams come True"
1 Wordart - "All Girl"
1 Wordart - "I wasn't born a princess, but..." we don't know any of these do we?? 1 Wordart - "Daddy's little Princess"
1 Wordart - "Prince Charming" - who's in this one do you think? 1 Wordart - "Our Little Princess"
1 Wordart - "Once upon a Dream"
1 Wordart - "Pretty as a Princess"